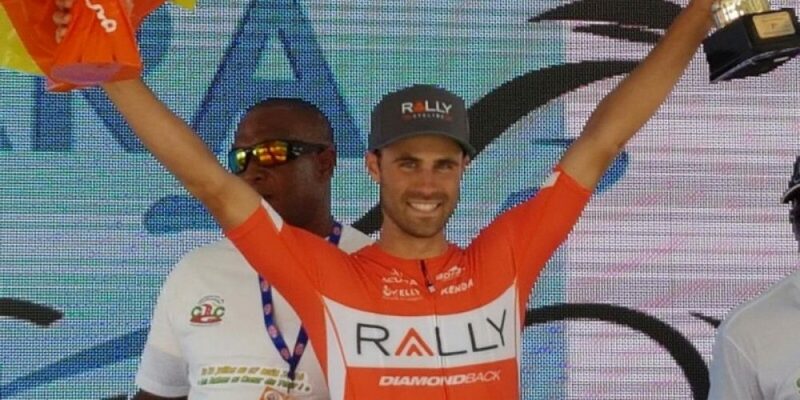 Jesse Anthony sprinted to victory today in the third stage of the 2.2 UCI ranked Tour de la Guadeloupe, July 29 – August 7. Anthony outpowered Yolan Sylvester of France and Venezuelan Jose Chacon in the dash for the line. Anthony’s Rally Cycling teammate Bjorn Selander finished in eighth, giving the squad two riders in the top ten. It is the second stage victory of the race for Rally Cycling after Brad Huff won the opening prologue. The win serves as a tremendous morale boost for the team after Huff suffered a horrific crash in stage one while in the leader’s yellow jersey. The crash occurred with just 6 kilometers remaining in the stage. As another rider and race motorcycle swerved to avoid each other, Huff lost traction on a downhill bend and slid under a guardrail and off a steep embankment. As he went under the railing, he suffered a 16-inch laceration on his back that required over 30 stitches. Due to his injuries, he was forced to abandon the race. With Huff out, Anthony took over the leader’s jersey but was unable to defend it on stage two. Dropping to over two minutes down on the general classification, Anthony and the rest of Rally Cycling are now focused on winning stages. In addition to Anthony, the team still has Selander, Kline and Soladay all on the hunt for stage glory. The Tour de la Guadeloupe concludes on Sunday after covering almost 1200 kilometers around the picturesque island. Anthony’s victory also serves as inspiration to the team as it starts one of the hardest races of the year, the Tour of Utah. Just as Anthony was crossing the line in Guadeloupe, the Utah peloton was descending into Cedar City for the stage one finale. Although the team wasn’t able to land on the podium, general classification riders Rob Britton and Evan Huffman arrived safely and are in good position. Pierrick Naud was the team’s top finisher on the day, crossing the line in ninth.